Take bus number 36 (TO "CASCINE DEL RICCIO"), 37 (to "TAVERNUZZE PRIMO MAGGIO"), D (to "FERRUCCI"), or 36A (To "CASCINE DEL RICCIO") and get off at bus station “CALZA”. From Florence Central Station you can also reach bus station Calza (Porta Romana) on foot (see map). From bus station "CALZA" take bus 38A (to "FERMI") and get off at bus station "FERMI". The bus station is next to the entrance of the hill where the Department of Physics is located. Walk up the hill and you will find number 2 on your left. You can download the timetable of Bus 38 A here. Please note that this timetable was last updated on April 7, 2014. To check possible changes of routes and timetables please see www.ataf.net. From bus station "CALZA" at Porta Romana take bus 38A (to "FERMI") and get off at bus station "FERMI". The bus station is next to the entrance of the hill where the Department of Physics is located. Walk up the hill and you will find number 2 on your left. You can find all information about bus routes and timetables here: www.ataf.net. Every half an hour there is a bus service to Florence Central Station. From there see the information above. 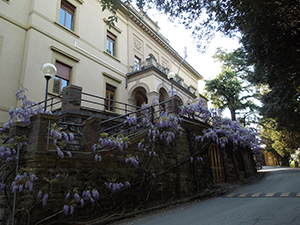 Walk up the hill along Viale del Poggio Imperiale until you reach the Medicean Villa del Poggio Imperiale. Turn left and walk to Largo Enrico Fermi: you'll see a bus station and a gate right in front of you. Enter the gate and walk up the hill until you find number 2 on your left (see map). Take exit Firenze Impruneta. At the roundabout take the 3rd exit onto Via Senese. Turn right onto Via del Gelsomino and then turn right onto Viale del Poggio Imperiale. At the end of the street turn left onto Largo Enrico Fermi. Take the exit onto A1/E35 towards Rome and then the exit Firenze Scandicci towards Florence. Merge onto SGC Firenze-Pisa-Livorno, continue onto Viale Etruria and go through one roundabout. Continue onto Viale Francesco Talenti. At the roundabout, take the third exit onto Via del Sansovino. Turn right onto SS67. SS67 turns slightly left and becomes Via della Casa Giovanni. Slight left onto Via Pisana. Turn right into Piazza Pier Vettori and then again on the right into Via Raffaello Sazio. Continue into viale Aleardi and into Viale Pratolini until you reach Viale Francesco Petrarca. At the roundabout take the 2nd exit onto Viale del Poggio Imperiale. Turn left onto Piazzale del Poggio Imperiale. Turn left onto Largo Enrico Fermi.